Piston air compressors across multiple brands vary in performance. While cheaper machines are available, their performance can never be relied upon by the business. The price will be soon forgotten, but the quality, efficiency and reliability factors will impact the performance of the compressor throughout the life of the machine. Look out for efficiency, pressure, run time and brand when selecting a new air compressor. Single stage compressors are cheaper, but less efficient. More suitable for home applications or when not needed often, single stage compressors offer the advantage of a larger capacity at lower pressures. For serious commercial and industrial applications such as in workshops and auto shops, a two stage compressor is recommended as they give better efficiencies at higher pressure. Check whether a compressor with 7 Bar pressure is sufficient for the tools in operation today as well as newer requirements in another two years. Two stage compressors would go over 9 Bar. Run time is an important factor that impacts productivity, especially in commercial applications. It’s no good if the compressor overheats in 15 minutes, or is not able to work in the 40°C temperature of the typical Aussie summer in the workshop. Hitachi two stage compressors can run nonstop, without the need to cool down. They can operate with a duty cycle of 100% compared to cheaper single stage machines with a duty cycle of 50%. 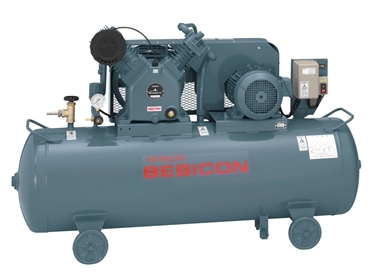 A good brand stands for quality, value for money and durability, such as Hitachi piston air compressors, the leading name in reciprocating compressors in Japan, with more than two million units sold throughout the world. Now available in Australia, Hitachi piston air compressors are recommended for businesses to perform at their best. Hitachi reciprocating compressors are available from Hurll Nu-Way Pty Ltd .